I was doing some work for a client this last week. I was training a gardener to build a compost pile so we went biomass gathering around the farm, bringing back piles of rotten fruit, cut grass and green weeds, along with dried grass and leaves so we could make alternating layers of greens and browns. While gathering rotten piles of brown grass from a recently cleared field, I discovered something annoying. Inside the rotting grass were pieces of wedelia stems, rooting and green, just waiting to be added to the compost pile where they could infect the gardens forever. I looked around at the area where the grass had been cut and saw lots of the same species growing among the grass. 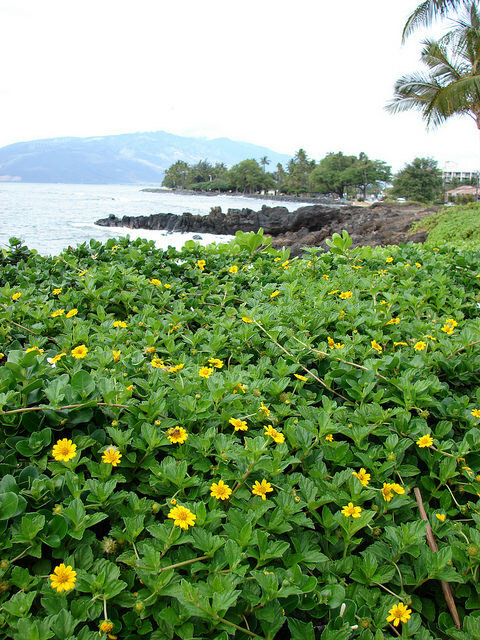 Wedelia, also known as Singapore daisy, or most properly under the tongue-twisting Latin name Sphagneticola trilobata is a pain-in-the-neck plant often used as an ornamental for its thick growth and pretty yellow flowers. I know I tell you to “compost everything,” but there are times when we have to exercise some care lest we introduce an invader into our gardens. I don’t trust that the pile I built is big enough or will get hot enough to cook wedelia pieces and keep them from ending up running through and over the compost pile. I can’t uncover research on feedng wedelia to rabbits, chickens or goats, but if it won’t hurt them, that would be a better way to turn it into something usable for the garden. Another option might be my anaerobic barrel composting method. 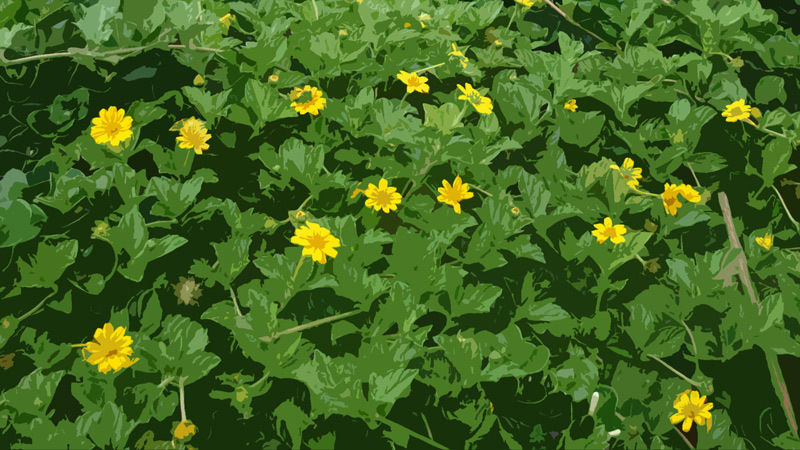 If you already have wedelia in your yard and landscape, it does make a good groundcover. I wouldn’t introduce it on purpose, but keeping it in beds and string-trimming the edges does look nice. To get rid of it, you need to pull up all the vines and remove the stems completely, or it will pop back up quickly and take over again. *Wedelia image by Forest and Kim Starr, Starr Environmental. My New Chop and Drop Video! I hate this stuff it is all over my N Ft Myers, Fl backyard. I looked up if my sulcata tortoise could eat it. Internet said no. High oxalic acid content if i remember correctly. He dont like it anyway. Pot belly pig is disinterested also. There are medicinal uses but i havent tried it. I am planning on composting a lot of it soon with a heavy tarp to block out the sun. Waiting on the first real cold front. Shampoo ginger is my other foe.